In America's backwards calendar days, it is 8/6/12, a perfect day to honor the trusty steed of the budget racer, rally driver, and drifter for the past few decades. In three videos, let us celebrate its drifty goodness. Cheap and rear wheel drive. It's all it ever needed to become one of the most popular drift cars worldwide, the old-school alternative to the ubiquitous Nissan S-Chassis. Here's one in Slovakia at the end of last December. Much as we associate the last rear-drive Corolla with drifting, tons of amateur racers have campaigned the AE86 since they debuted. Here is a turbocharged Hungarian Corolla GT showing how well it adapts to tarmac rally. The overrun is unreal. AE86s are cheap enough that any kid can buy one if they can find one that hasn't been crashed into a tree by now. You're looking at the car with which thousands and thousands of drivers have learned how to go sideways, how to run a racing team, how to have fun with cars. The modern successor to the affordable RWD AE86 is Toyota's own GT 86/Scion FR-S. Here's Federic Aasbo's 700-horsepower 2JZ-powered GT 86 tearing it up around Rudskogen, Norway. 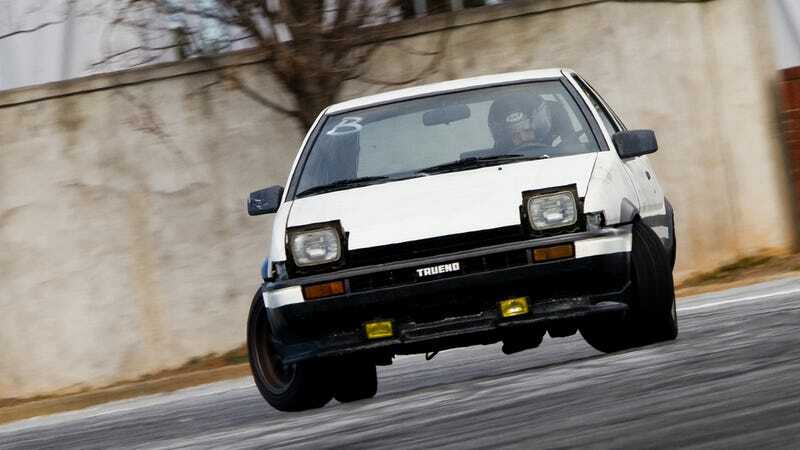 In ten or fifteen years we'll see rusty Toyobarus sliding around circuits and fields, just like AE86s today.